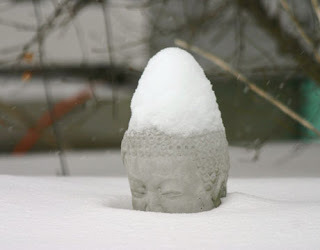 A 22" Buddha is up to his nose in snow in Appleton, Wisconsin. Photo by Bob Elko. Thanks to the Daily Green blog. And thanks to meditator Gordon Gaippe, Des Moines, IA, for suggesting this picture and writing the accompanying haiku verse.